When I initially viewed this pattern on Sew Tara’s Friday CreateAlong, I thought it was really cute and I have a drawer of hexies I made last summer that needed using. To be honest, I sew by the seat of my pants. I feel I’ve made so many patterns, both craft and garment, that I’m able to anticipate the next steps and NEVER read a pattern from beginning to end prior to starting. In fact, I pretty much cut fabric as I go. Despite my loose methods of construction, let me just defend myself by stating that I found several errors in Microsoft’s tutorials which were confirmed by teachers who had never noticed them before. My confusion with this pattern started when I was installing the zipper, I worked it out but not before ripping out stitches and calling Tara to discuss. If I were to make this pouch again I would jazz up the back by insetting more hexies or using a different fabric. I would also shorten the strap as I find it a tad too long. This zippy pouch is a great size, I don’t typically make my pouches with straps but I think I’ll be adding them in the future. If you’d like to give this pattern a try, you can find the free tutorial on OCD’s blog by the Plaid Scottie. 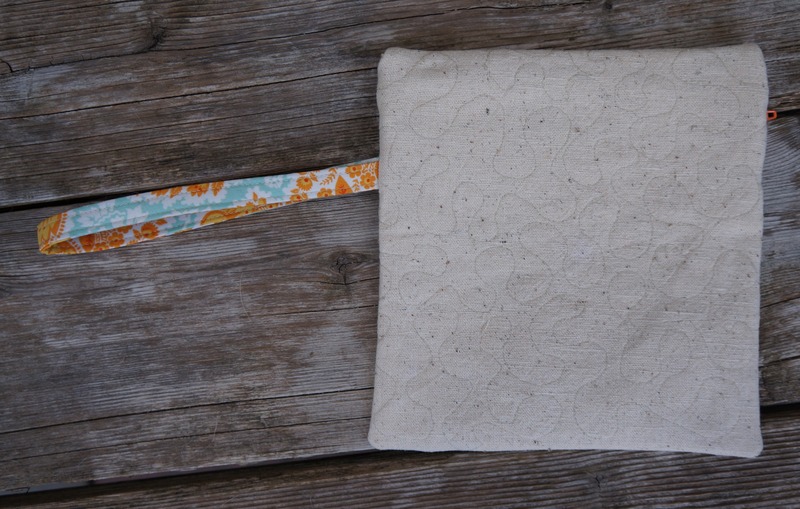 Next on Sew Tara‘s Friday CreateAlong is the Melinda Zipper Pouch from I Think Sew. 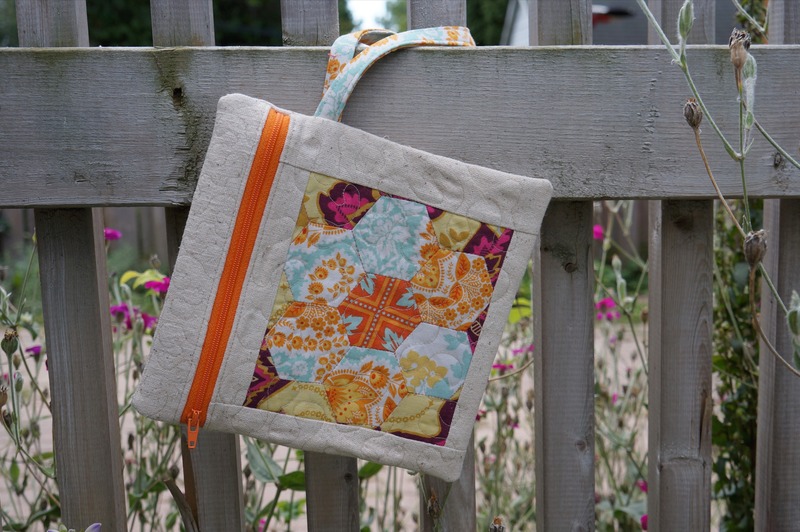 This entry was posted in Finished Objects, FMQ, Hexies, Sew Tara, Tutorial and tagged OCD, Zippered Pouch by Tabatha. Bookmark the permalink. I love the pops of orange.